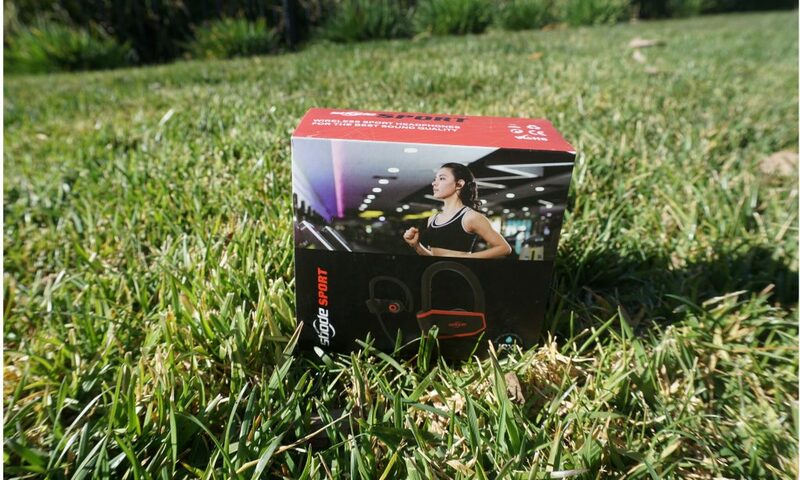 Today we were able to grab a pair of the Sport Wireless In-Ear headphones by Sbode Design for a fair and honest review. No payment was collected. 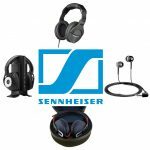 Instead, we wanted to give it a go since we’re always open to trying to new pairs of headphones (despite how many there are out there). Considering these are waterproof (yes, the standard IPX7), Bluetooth, Siri activated (we don’t personally use it but tried it out for the review) and have some silicone fins to pertain to those who want a sturdy fit (especially if you’re exercising), it’s a nice combination of the popular features found in many in-ear headphones today. Let’s see how it stood up. At first unboxing, we have a nice little case that will fit in most jean pockets — as seen in the photo, it fits just in the size of my palm. Zip it around and you get an oval opening to keep all of your gear (and more if you’d like) in there. We wouldn’t recommend taking the ear tips out yet — keep them in that plastic bag since there isn’t a sturdy pocket for them to go in (albeit there is a pocket, but they can fly out when you open it). 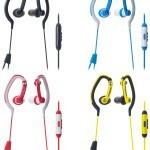 We like the build of the Sbode Sport in-ear headphones, especially when it comes to how much they cost. They aren’t too flimsy, the silicone fins won’t break off easily, and the ear tips feel relatively comfortable when wearing them. The cable is also solid and won’t be breaking on us easily if you take proper care of it. However, we do want to note that these fins aren’t remoable and therefore non-replaceable. They don’t come off naturally so if you break one, the pair is just about gone unless you want to break the other side to match and have a regular pair of in-ear headphones. So this definitely limits it’s population to those who want fins, which is always the case, but many times for those who are exercising. The case is also quite nice, although not leather at all. It’s a slick hybrid of hard-shell and soft mesh. 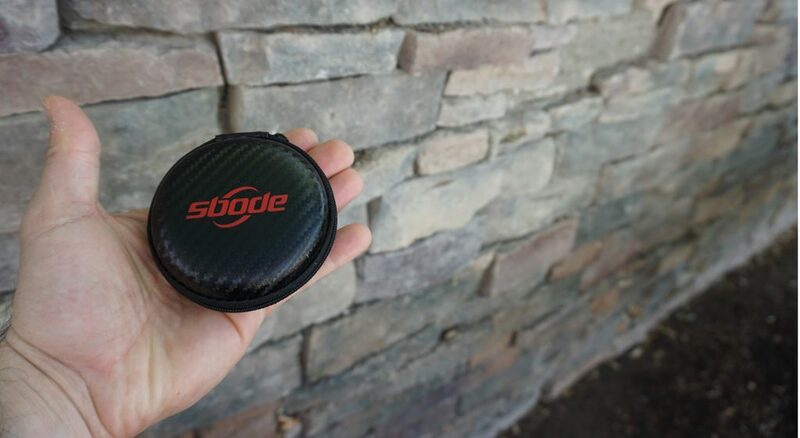 It’s not going to survive a car rolling over it, but if you can keep your headphones in this you’re going to be protected, especially if you travel and want to keep them safe. Pairing was actually easier than we thought. We charged them right out of the box before using (just plug-in the USB to your computer and the headphones on the other end and you’re good to go). We simply turned them on and that blinking blue light on the right headphone will start to immediately want to pair with a device. The device will show up as “Sbode 08”. Once paired, it’ll say in a female (British?) voice — “Your headset is connected!” and voila, you’re good to go. We didn’t even have to press the Bluetooth sync button — just powered it on for the first time and it already showed up in our phone’s (iPhone 6S) Bluetooth devices list. So now that we’re connected, let’s get to playing some jams on the Sport wireless. 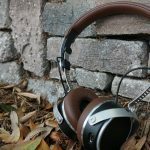 We went through about 4-5 different genres to get a good feel of how these things sound, since in our opinion the #1 factor in determining which headphones are best aside from perhaps build is sound quality. As we continue to review headphones and gain more experience, the number one question (at least for now) we ask is this — is the bass embellished? It could be our style or preference; however, we’re into none of the three frequencies being higher than others. We want flat. If it’s your preference to have some more bass to your songs, you do you. Regardless, we put on some, of course, Dr. Dre and a little D12 to check out how the bass sounds. The bass is indeed just slightly magnified, especially in a genre such as hip hop. For some smooth jazz on the other hand, it sounded quite clear in regards to a balance of highs and lows. The highs are very bright, mids are pretty noticeable and the bass blends quite well with the mix. We don’t have complaints here, although as audiophiles, we obviously aren’t getting studio headphone sound or anything. To put it simply, you don’t have to be concerned if these sound bad considering the price. The built-in microphone also works as intended. We went about 20 feet away from our phone and called a friend to test, and they said our voice was as clear as it would be if we were holding the phone. The control center is also great — you can answer calls with the BT button, adjust volume, and by holding one of the volume up or down, can skip from previous to next track. We went to go refill up our coffee mugs while editing this. Let’s see how it fared. We have our office upstairs and kitchen near the back-end of the first story. It ended up cutting in and out about 30-35 feet away from our phone, which to us is an amazing distance for a pair in-ear phones in this price-point. We dig it. We’re big into lifting but also run on the treadmill for about 15 minutes before our workouts. 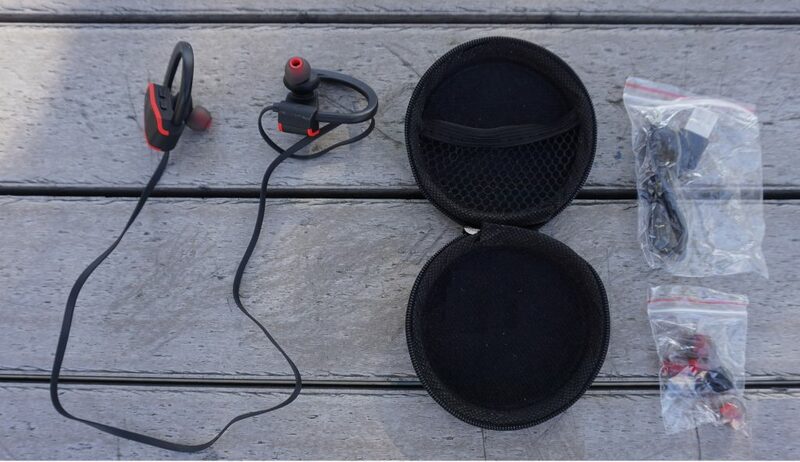 So we took this into the gym last night to see how the Sbode Sport headphones fare. First off, we’re usually more of a wired type of person when it comes to the gym. Our reason is because we just sometimes flat-out forget to charge them and (yes, it has happened more than once) they die on us in the middle of a workout. Most cars however now have a USB jack to keep them charged as you drive through out the day, but that’s if you even want to keep these in there — you may want to use them for other applications. In that case, you’re just going to have to remember to charge them. When first getting to the gym (were going to take some pictures of the headphones on a treadmill but forgot), they automatically paired with our phone once we turned them on, which is great and convenient so we don’t have to fiddle with pairing every time we lift. Once running on the treadmill, these things were quite comfortable. When first putting them in, they felt loose, but if you give them a twist into your ears they settle in. The fins also worked very well when running — didn’t even come close to falling out or having an issue with them jiggling while we ran (as fast we could!). When lifting weights, again, no problem. A majority of our lifts intended we sit upright or even stand. We did want to try a few exercises in which we were laying down. For most of them, we were quite fine; however, our left ear started to fall out a few times (a dumb bell laying press we were doing). It started to annoy us we’ll be honest. With some experimentation, we realize we hadn’t twisted it enough to make sure it was sturdy. After really jamming into our ears (no, not uncomfortably), we were able to find a good spot and it stopped falling out. We also noticed that the wire at the back of our neck was a bit tangled, so fixing that also helped. As advertised of 8 hours of play time, we wanted to double-check how it went. Through out the week, we accumulated as much time as we could (at a volume of about 75% of our phone) and they worked all the way until dying at about 8.5 hours. At 100%, they may go for a little less, but you’ll be fine and it works as advertised — even a little more! Waterproofing — did it actually work? We literally took a shower with these things on, considering on their Amazon page it has a stock photo of a dude with them on while it’s pouring on top of him. While doing so, the music worked well (why haven’t we thought of doing this before) with no problems at all. Afterwards, it was fine, we survived, and saw no damage to the headphones. Afterwards, we waited about a day to see how they would hold up, and yes, they’re still working as we type this. So for those who are worried about some water splashing on them, you’re fine. If you like to run in the rain, hang out by the lake or pool, etc — you will be OK to go there as well. 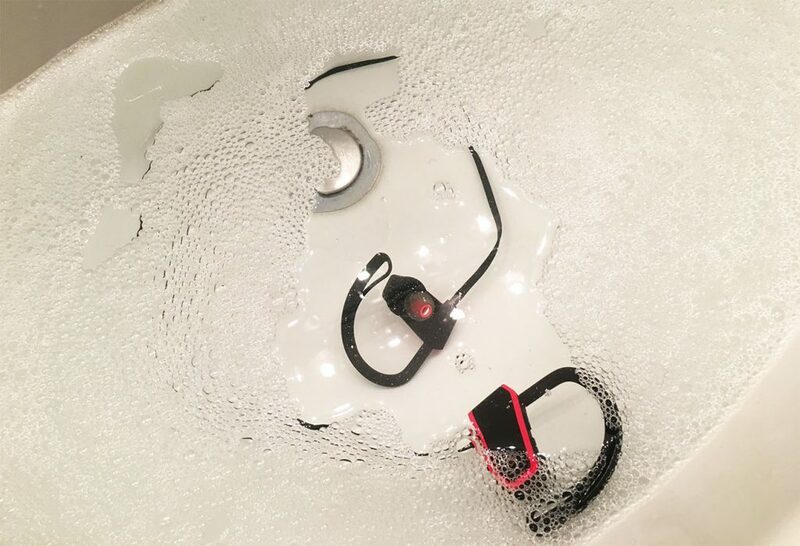 But what about submerging the headphones under a large amount of water? We wanted to see how it went. So we filled up our sink and stuck them in there for about a minute while music was playing to see how it would go. The verdict? We dunked the Sbode Wireless under water for 30 minutes and they still worked a day later. Beautiful. I couldn’t hear them once dunked under water, but that’s normal when it comes to “science”. After letting them sit for 30 minutes, I left the music playing and voila — they continued playing once I removed them. Of course, water damage takes time, so we waited 24 hours to try them out again and they worked just as they had before the water exposure. Great work, Sbode. We couldn’t (and wouldn’t want to) start counting how many pairs of Bluetooth headphones there are available nowadays. We were contacted by Sbode Design to give a fair and honest review here, and in our experience and opinion, think these are great considering that price of $25 (as of writing this in January 2018). 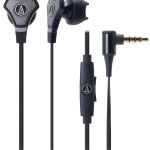 If you’re not into expensive, high-end or even middle-tier price-point in-ear headphones with the popular Bluetooth and waterproof combination, then these are a beautiful pair to buy and rank up there in terms of just overall effectiveness. 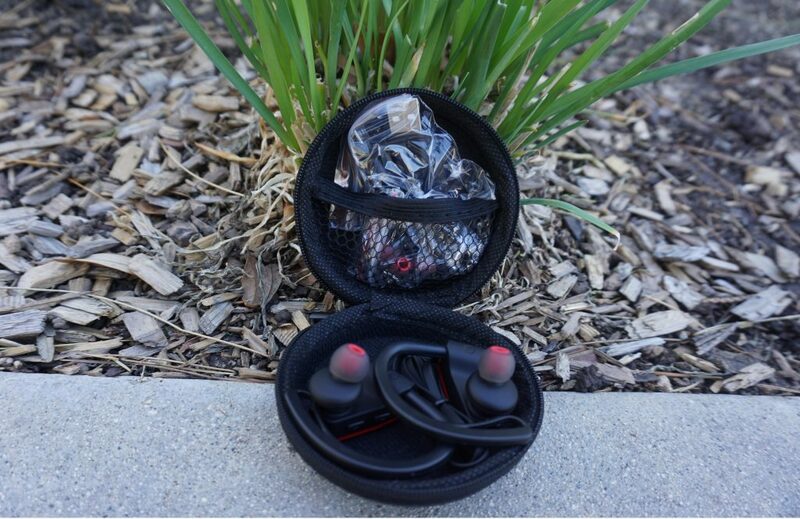 They’re not definitely from a “big brand” and may appear as a ‘knock off’ at first, but to us they’re legit, from the overall build all the way to the advertised features of waterproofing, Bluetooth and of course, sound quality. 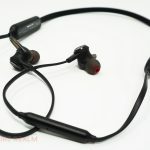 We don’t have any complaints about these, aside from perhaps the slight bass boost when it comes to the sound quality. A few other cons we may find is the fact that (at least for us) in-ear headphones cause some pain after using them. Maybe our ears are sensitive, but we’re more in to earbuds vs. actual in-ear pairs not only for pain-free wearing but also our paranoia when it comes to ear damage. We definitely don’t recommend listening to these on full volume (trust us, we have slight Tinnitus in our right ear). 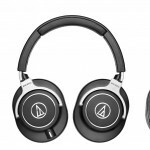 When it comes to competing against other wireless headphones or even waterproof headphones in general, they won’t compete with those above the $100+ price-point, but that’s expected because these cost nearly a quarter of that price. 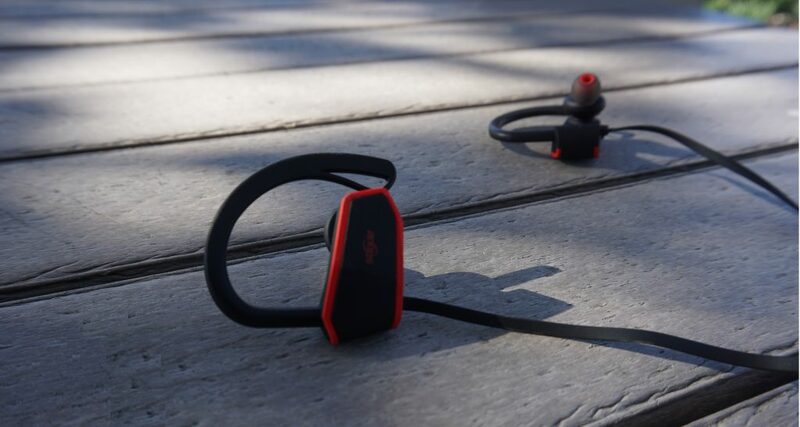 When it comes to a budget-friendly pair of in-ear, waterproof, Bluetooth and (if you’re into it) Siri activated in-ear headphones for running, working out or other uses that ask you for the need of these silicone fins on them, you’re good to go with the Sbode Sport In-Ear headphones.